Nightclubbing was her fifth album and many regard it as her best. She began as a model, became a regular face at Studio 54, a disco queen and gay icon, and then changed musical direction in 1980 with Warm Leatherette, a new wave album that attracted a cross-over audience coming from the rock scene as well as disco. Nightclubbing (1981) has Jones’ tenderly aloof remake of David Bowie and Iggy Pop’s “Nightclubbing” from The Idiot, as well as the ferocious “Demolition Man” written by Sting. Her voice is as imperial and commanding as her image on the sleeve, like a piece of sculpted obsidian. I always assumed that Nightclubbing’s front cover was a photograph taken and retouched by Jean-Paul Goude, Jones’ visual collaborator and stylist. But when I dug out the original vinyl LP to check the cover credits, I found it was described as a “cover painting.” Nevertheless, the credits for “Hair and Make-up by Jean Paul [sic] Goude” and “Jacket by Giorgio Armani” imply a photoshoot, so this must be the image’s origin, and Goude often modified his photographs of Jones. 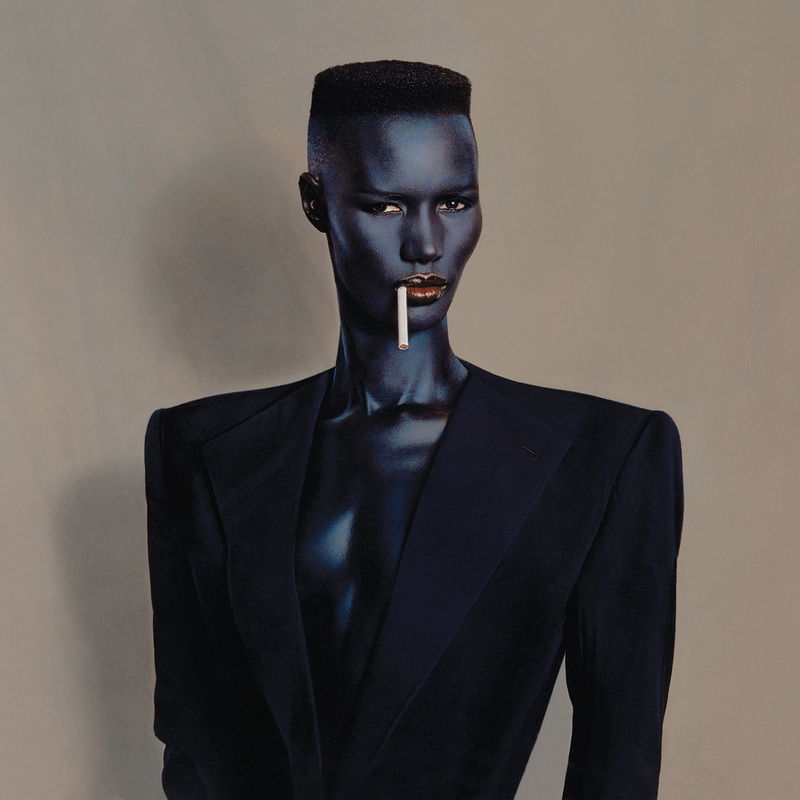 Goude admired Jones for her mixture of beauty and threat, and the Nightclubbing portrait expresses this duality with absolute composure and no false histrionics. The cover picture became the starting point for Jones’ brilliantly performed “A One Man Show” tour in 1982, which Goude made into a film. Jones has the dance moves when she needs them, but her raw charisma heats the air whatever she does. A true original, she has cold fury in her soul and casts a long shadow. Now this androgynous figure reminds me of Mystique from the X men. The intrigue and mystery of a shape-shifting figure is wonderfully portrayed here and you can almost imagine this creature moving silently through the night unnoticed but for the shadows that you think you see. I would love to actually see a series of similar photos of models dressed entirely in a single color like this!